This research area explores the physics and control of thermal effects in materials with ferroic order, one of the most underdeveloped areas of solid state materials science. We focus on the development of materials and know-how to enable pyroelectric energy conversion of waste heat to electrical energy, electrocaloric solid state cooling, thermally-driven electron emission, and more. Our comprehensive approach includes aspects of materials design, synthesis, device fabrication, and advanced characterization development and utilization. Recent work in this regard has provided understanding about the role of domain walls in pyroelectric response, produced novel methods for studying heat-based effects in ferroic thin-film capacitors, and demonstrated colossal energy conversion processes in materials. Materials that exhibit simultaneous order in their electric and magnetic ground states hold promise for use in next-generation memory devices in which electric fields control magnetism. 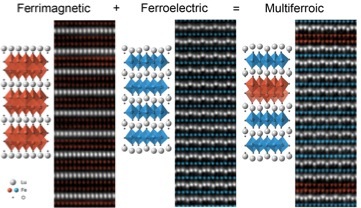 Such materials are rare, owing to competing requirements for ferroelectricity and magnetism. 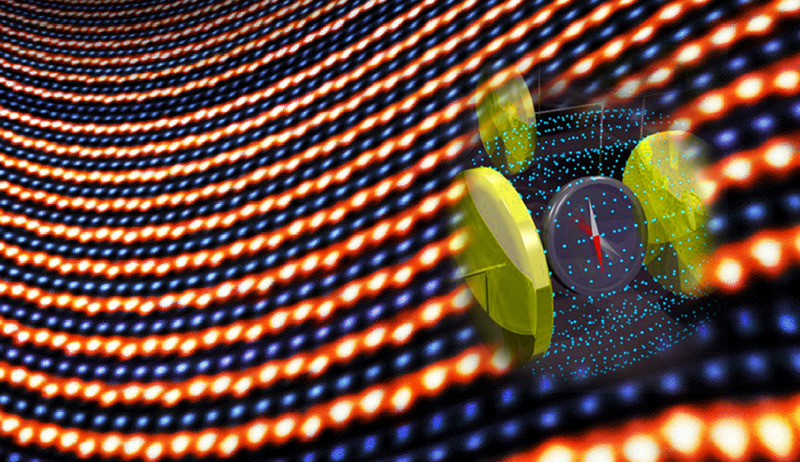 We've developed a methodology for constructing multiferroic materials in which ferroelectricity and strong magnetic ordering are coupled near room temperature. Starting with hexagonal LuFe03 -- the geometric ferroelectric with the greatest known planar rumpling -- we introduce individual monolayers of FeO during growth to construct formula-unit-thick syntactic layers of ferrimagnetic LuFe2O4 within the LuFeO3 matrix, that is, (LuFeO3)m/ (LuFe2O4)1 superlattices. The severe rumpling imposed by the neighboring LuFe03 drives the ferrimagnetic LuFe2O4 into a simultaneously ferroelectric state, while also reducing the LuFe2O4 spin frustration. The ferroelectric order couples to the ferrimagnetism, enabling direct elecric-field control of magnetism at 200K. Multiferroics present the ability to control magnetism with electric field at AttoJoule energy scales. 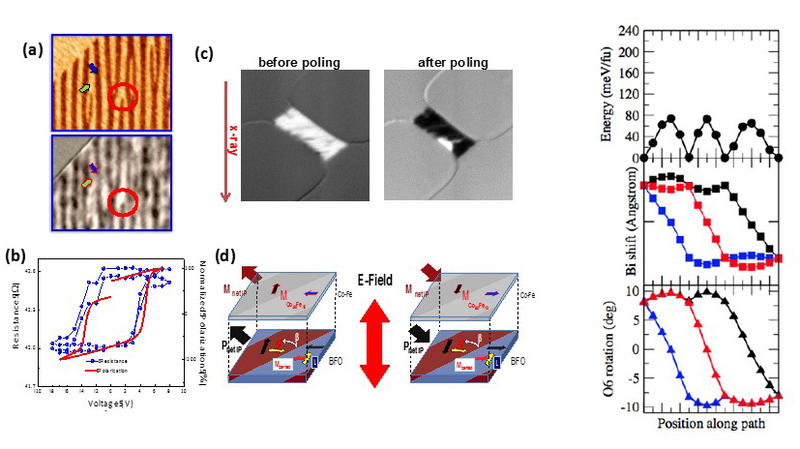 The single-phase multiferroic material, BiFeO3, exhibits magnetoelectric coupling at room temperature with weak ferromagnetism arising from the Dzyaloshinskii–Moriya interaction. Here we show a deterministic reversal of the D-M vector and canted moment using an electric field at room temperature. First-principles calculations reveal that the switching process favors a two-step switching process in which the DM vector and polarization are coupled and 180° deterministic switching of magnetization hence becomes possible, in agreement with experimental observation. Our results suggest ways to engineer magnetoelectric switching for nanometer-scale, low-energy-consumption, non-volatile magnetoelectronics.